2019 Crew Training Seminar Open for All--Especially Non-FBYC Members! Beginning May 5 - practices held on Fishing Bay and also coinciding with racing opportunities at Spring Series races. Session gets Junior racers back on the water early and prepare sailors for the upcoming Summer Race Team. Registration now open Opti-Kids, Junior Week and more. Fishing Bay Yacht Club welcomes membership inquiries. The crane on the Jackson Creek bulkhead is not operational and has been locked down to prevent damage to the crane or boats. We do not have a service schedule yet. But we will provide updates as they are available and appreciate your patience. Here is a gentle reminder that the deadline for Early Bird Entries for SBRW 2019 is rapidly approaching. On Tuesday, April 30th the Early Bird discount flies away! 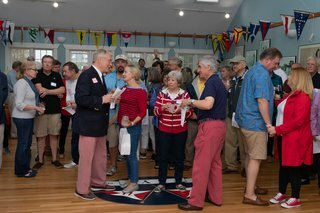 More than 150 members celebrated FBYC's Opening Day events. What did we do? We raced 'round the marks; heard the bagpipes call; gathered to bless the fleet; enjoyed great live music; tasted local wines and ate Italian dishes. More than anything else, we rekindled long-term friendships and traded tales of "boat ownership woes" and plans for the next cruise. Housing needed: FBYC to host the VA Commonwealth Championships at our annual jr regatta. June 21-23. Clubs from ga, sc, va, md, and de are planning on attending. Please email Kathryn Angus at kangus@angusco.com if your home or spare bedroom is available for sailors or coaches. The cooks are making ready. The Dark 'n Stormies have been ordered. The band is tuning up. And every sailor is crossing their fingers, hoping for fair winds and clear skies. This year's Opening Day is going to be something special! The UP Bar will feature Italian wine tasting and elegant starters. The dinner--from eggplant parm to lasagna--will be delicious. And the music will set your feet a dancing. The crane on the Jackson Creek bulkhead has been cleared for light boat use - such as J/70's, J/24's, and Flying Scots. Larger boats, like the Tartan 10 are too heavy for the current configuration. Please check with Docks Chair if you have an operational or compatability question. This year's Fishing Bay Challenge Bowl is inspired by past challenges. The goal of 2019 challenge is to continuously integrate Junior members across all of FBYC's sailing programs. Awarded to the offshore or one-design boat that has consistently integrated junior crew into their racing program. 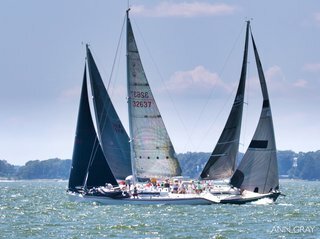 An FBYC registered boat must sail with at least 1 FBYC junior crew member in races where FBYC is the organizing authority. The races must occur between 4/13/2019 and 11/16/2019.